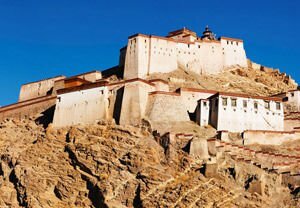 The impressive fortress Gyantse is dominated by its greyish rocky hill above the town, situated in the southern part of Tibet’s Autonomous Region and the northern coast of the upper reaches of the river Nyang Qu. She in turn is a tributary of the river Yarlung Zangbo. In a literal translation from Tibetan Gyantse ("ghee-YAHN-tsee") means "the peak of victory” and the tip of the ruler's palace. Unfortunately fortress Gyantse stands notorious in the place where the British army applied the first mass assault in the history of the Tibetan people in the past century (1903-1904 on). With the invasion of the UK, Single troops on the high hill Gyantse are bombed and more than 1000 Tibetans are killed. Today, however, the enormous tragedy of this nation, when over the past 40 years when China is trying to subject it to communism could be seen almost nothing. On top of the fortress of Gyantse Dzong is an “anti-British" museum. The fortress itself was impressive with its size and structure. It dates from about the middle of 1400, as a combination of thick walls, round towers and rectangular buildings. According to Vitali, the palace was built around 1390 to guard the southern passes of the Tsangpo Valley, and Lhasa. Grand Palace Gyantse was erected probably in 1365 by the local Prince Phakpa Pelzangpo. Later in the 14th century his son Kungpa Phakpa (1357-1412 on) extended the fortress Gyantse . He moved the royal residence in the palace on the hill and built the first temple of Gyantse - Samphel Rinchenling. Although most of the walls of the fortress Gyantse are ruined, you can still see the murals from the so-called. Newari, which is the basis of the later style Gyantse. In 1967 during the Cultural Revolution, walls of Gyantse are bombarded by the Chinese, but there is little evidence and records of abuse. After this incident, Gyantse is gradually restored and is still dominated by its hilly overrule side of the Tibetan valley.